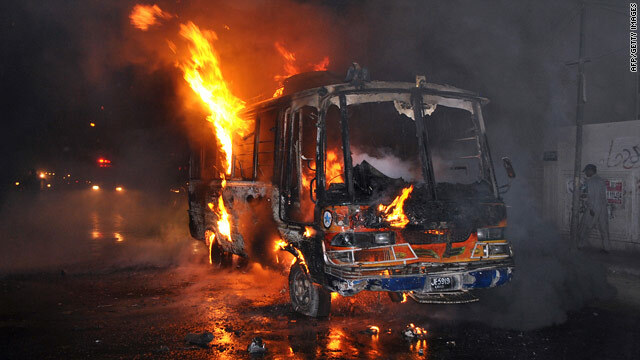 Pedestrians walk past a burning bus torched by an angry mob in Karachi on May 19. Islamabad, Pakistan (CNN) -- Authorities in Pakistan say they have arrested 200 people in Karachi after a series of what appear to be political killings there this week. The suspects were arrested in different parts of Karachi, the biggest city in Pakistan, Zulfiqar Mirza, interior minister for Sindh province, said Thursday. Paramilitary forces known as rangers have been given special powers to bring calm to the city, he said. Twenty-three people have been killed in Karachi this week, a senior government official said, though the state-run Pakistani news agency, the Associated Press of Pakistan, put the number at 17. Senator Zahid Hussain, central spokesman for the Awami National Party, or ANP, blamed the Muttahida Quami Movement, or MQM. He said the MQM is "killing our political workers," with around half of the 23 victims being members of ANP. But Haider Abbas Rizvi, an MQM senior leader, denied the allegations and said the conflict is between ANP factions. He said only one member of MQM was killed by gunfire. The ANP is the ruling party in the Pashtun-dominated region of Khyber Pakhtunkhwa, once known as North West Frontier Province. The MQM is the ruling party in Karachi. Both are partners in the federal government coalition.